There's always something exciting about beauty boxes, especially mystery ones. But what's even more exciting? A new mystery beauty box! Today I will be unboxing a new Korean beauty box that is based in Malaysia, called LOVEABOX. My really good friend Zyro, whom I met through blogging, actually started this company and sent me the first box to show you guys what it has to offer! 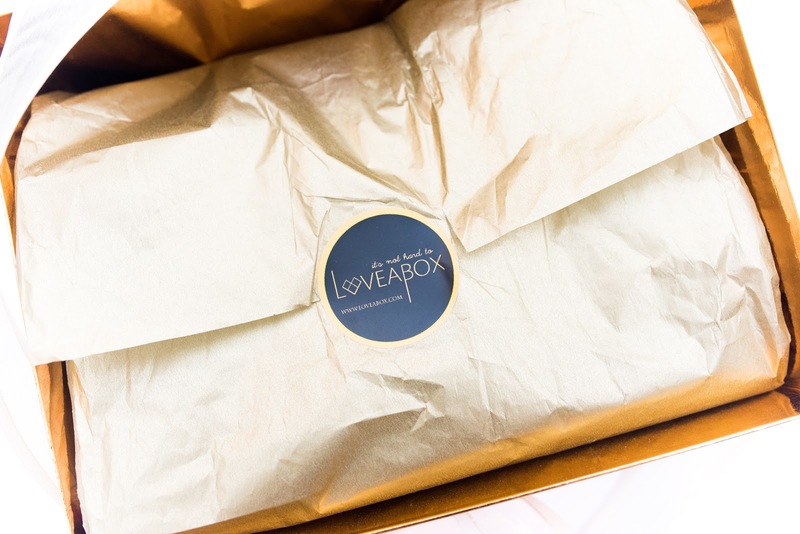 LOVEABOX is a monthly non-subscription box filled with Korean beauty products such as makeup and skincare which are handpicked with love. Each box contains at least 3 full-sized items, and costs 160 MYR (about $35 USD). They do ship internationally through EMS, so their boxes are available worldwide! What I have here is the November version of their box, called November to Loveabox. When it comes to beauty boxes, my only criteria is that I am willing to try out most, if not all, of the products included inside of the box. There can be products I dislike in the end, but ultimately it just needs to include products that I'm interested in testing out. I admit I'm a bit picky when it comes to mystery boxes, so let's see if this one passes the test! Before I start diving into what's inside the box though, just take a look at that packaging! It's possibly the most luxurious-looking beauty box I've ever seen. The box is sturdy and made out of this thick, stiff cardboard material that will be able to hold quite a bit of weight. It's definitely one that I will be keeping to use as a storage container! What I like about this box is that the middle part (the golden strip) is indented in, making it easy to open. Although the gold section of the box feels a bit flimsy, the black top and bottom ensure that the box as a whole is very durable. Honestly everything about the presentation of this box looks so chic and aesthetically pleasing! 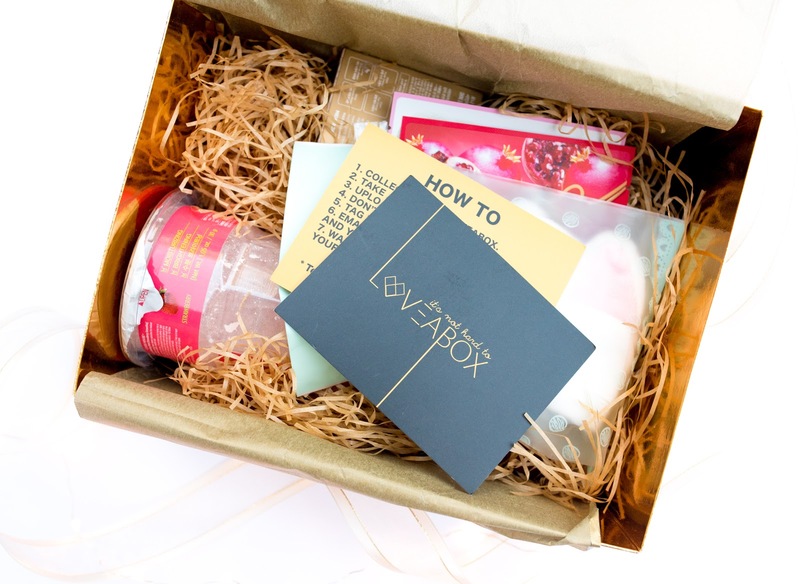 Also, their slogan, "It's not hard to LOVEABOX" is really cute. *Please note that the retail value I use for each product is based on its retail price in Korea. Some of the brands do have US online shops, but often times the prices are doubled compared to the Korean retail price. There are plenty of online shops that sell K-beauty products at or just slightly above their Korean retail prices, hence why I'm using the retail prices in Korea to estimate the value of each product. 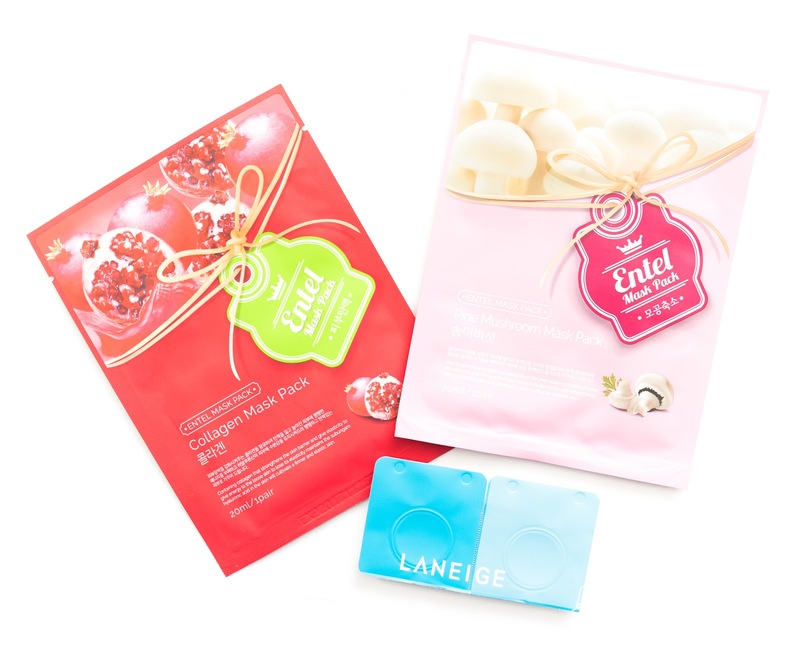 Upon opening the box the first things I saw were these sheet masks from Entel Mask Pack. The two versions I received are Collagen (featuring pomegranate as the main ingredient) and Pine Mushroom. Along with the masks were two Laneige Water Bank Moisture Cream_EX samples. The masks aren't anything special in terms of ingredients lists but I could always use more face masks, so these were a nice addition to the box. 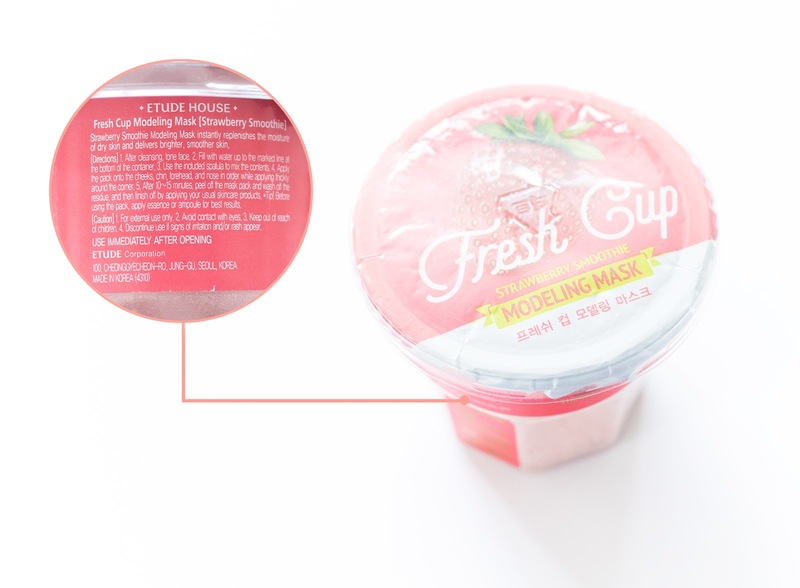 Up next is another type of mask- the Etude House Fresh Cup Modeling Mask in Strawberry. I've been wanting to try a modeling mask for awhile, so I was really happy to see this included inside the box. I haven't used it yet, but the mask smells like yummy strawberry candy so I can't wait to give it a try! Also included inside are a couple makeup products. 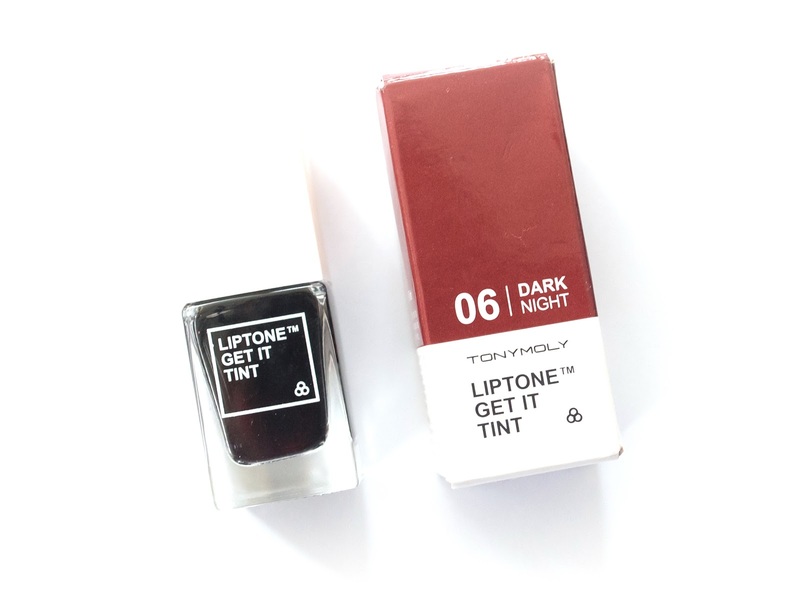 The first one is the Tony Moly LipTone Get It Tint in 06 Dark Night. I have one of these lip tints already, but I'm happy to get another one in a different shade. If you've never tried this lip tint before, I highly recommend that you do! They're very pigmented and long-lasting, and not drying at all unlike most watery lip tints. In fact, they're even a bit hydrating! Definitely my favorite water-based lip tint to date. The second makeup product included was this Pony Shine Easy Glam 3 Eyeshadow Quad in 03 Orange Blossom. 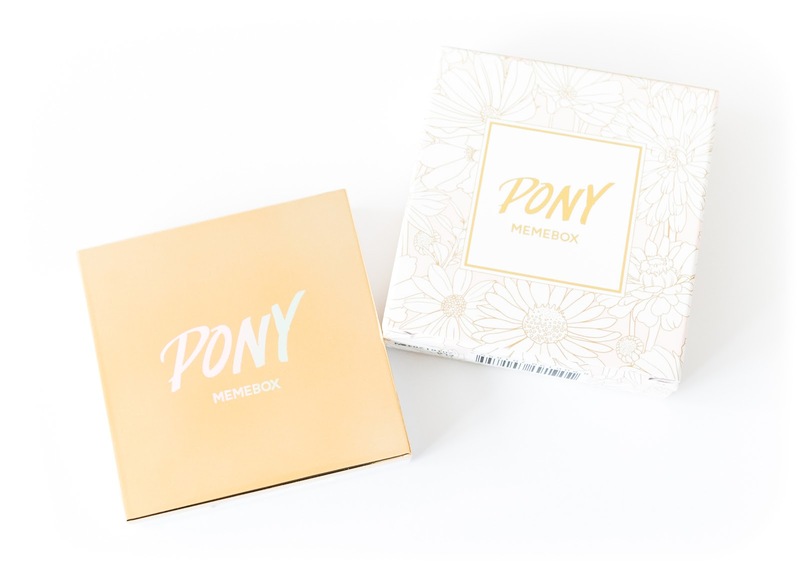 I'm a huge fan of Pony's own brand, Pony Effect, but I've never tried the products she made in collaboration with Memebox before. 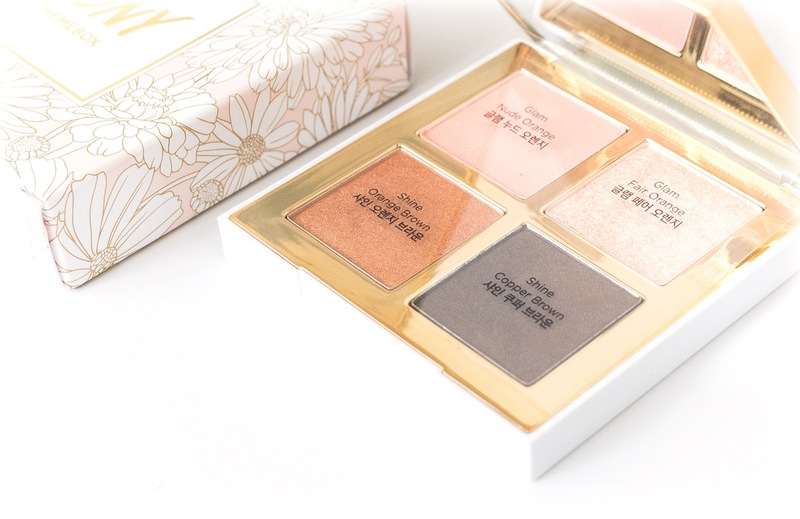 This eyeshadow quad is one of them, so I'm curious to see how the quality fares compared to her brand's. I love all of the shades in this quad though, so I'm excited to test it out! If the quality is just as good as the Pony Effect quads, I can see this becoming one of my favorite eyeshadows. Last but not least, there were two non-skincare and makeup products in this box. 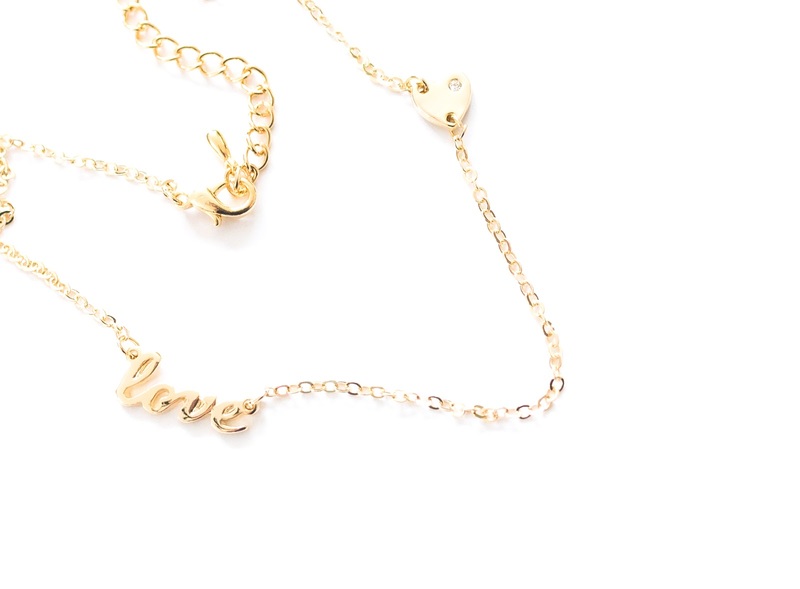 First was this really cute gold necklace with the word "Love" and a heart on it. The necklace is dainty, which I like. This was a nice surprise cause I didn't expect any jewelry in the box, and the quality doesn't seem cheap or flimsy. 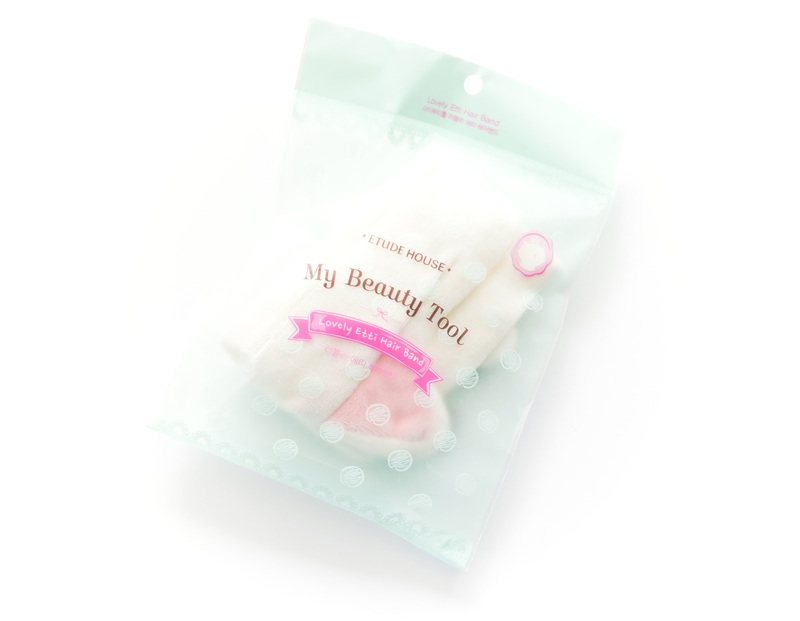 And finally, the last product: an Etude House My Beauty Tool Lovely Etti Headband. I actually own this exact same headband, but an extra pair is always welcome. It's an adorable cat eared headband that helps keep your hair back and away from your face when you're washing your face, wearing a mask, etc. And that concludes the November to LOVEABOX! The total retail value of this box came out roughly to $35.50, not including the price of the necklace. Do keep in mind that I used the retail prices of the products in Korea to calculate the value, so it may differ greatly if you're buying it online through a K-beauty shop. Although this box was nicely curated, it was lacking a bit in high value, which is what beauty boxes are known for. However, for me, this box was worth it since I actually will be using everything single product included. A lot of times with mystery beauty boxes I end up with at least 2-3 items that I won't ever use, so I appreciate it when a beauty box is well-rounded and contains not a single product I won't use. If you're interested in purchasing this box, the November to LOVEABOX is still available here. 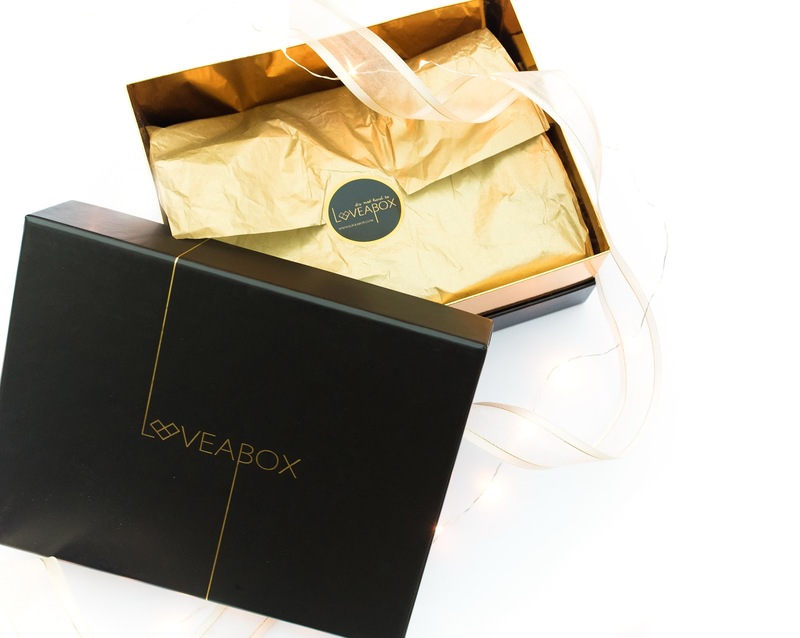 Unfortunately the LOVEABOX in December is sold out, but you can also check out the Makeup Exclusive Loveabox here. 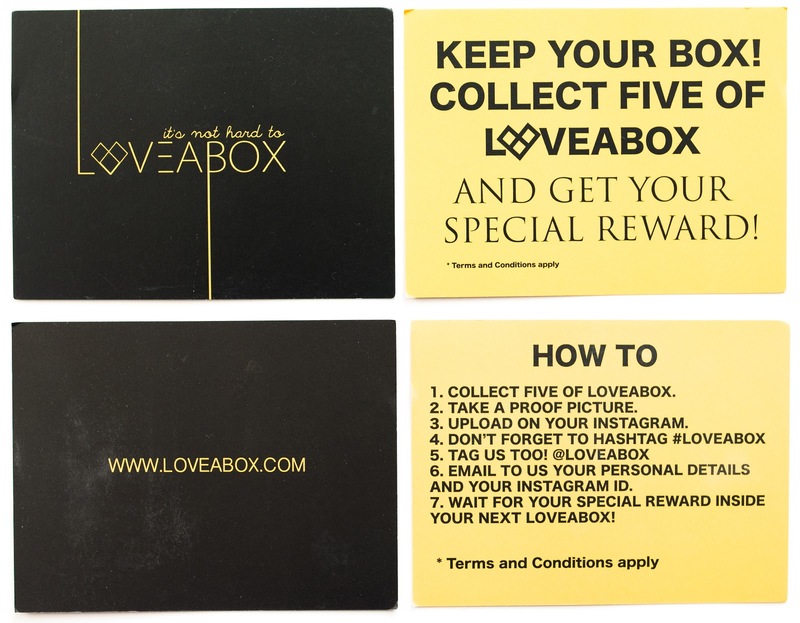 What do you think of LOVEABOX? *The products featured in this post were sent to me for review purposes.